superhero party balloon & cake package delivery merseyside, cheshire. Cake table dressed with tablecloth, personalised name superhero bunting/banner & table runner. X2 Large balloon bouquets with foil & latex balloons, ideal for enterance ways. X1 Large balloon arch in superhero party colours with comic book signs. X6 Table top balloon bouquets in matching superhero party colours. 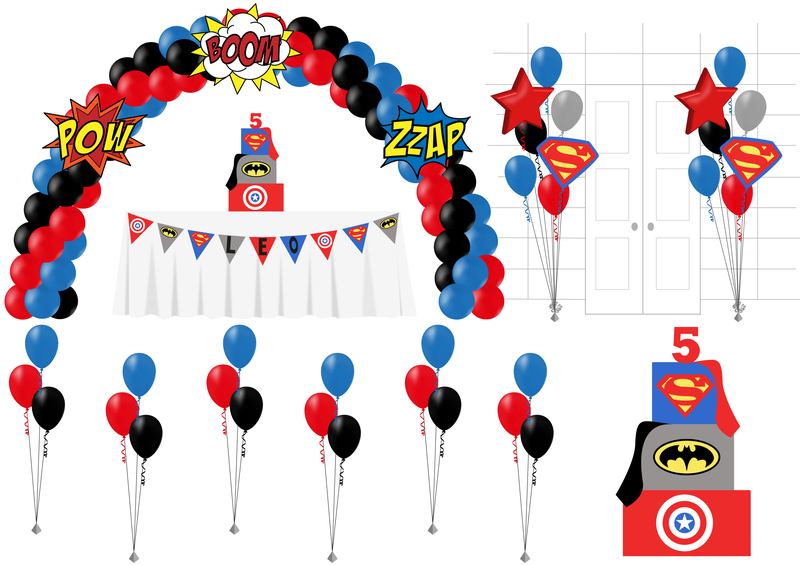 For additional superhero party balloon bouquets see our balloon chart for price list & more information. Turn your superhero cake table into a show stopping candy buffet! Decorative jars & platters of sweets and personalised treats in a stunning display. Check out our candy buffet gallery. X2 Large balloon bouquets with foil and latex balloons, ideal for entraceways.